Obi-Wan, on his search for General Grievous, runs into a man named Tion Medon, a tall, lanky man with a face made of corduroy and sharp needle teeth. All that is quite fine, except that it becomes clear that this man is not evil! The biggest surprise about Tion Medon is that he does not betray anyone or do anything evil. I figured that, since he was in the trailer, perhaps he would be a character of some importance. I was quite mistaken about that. Obi-Wan sort of holds a confusing conversation with the man and then leaves. As the man goes back to his people, they ask if Obi-Wan is bringing soldiers and Tion confesses that he has no idea what the hell just went on. This comforted me in knowing that I was not alone. After Obi-Wan chats with the corduroy man, he inexplicably leaves and returns to the planet on the back of the most ridiculous creature ever seen in a Star Wars film. It seems to be part iguana and part that chicken lady from The Kids in the Hall. He then clumsily rides the beast dangerously amongst some rocks while it jolts about and squawks uncontrollably. Presumably, Obi-Wan is looking for General Grievous, but he could just be taking a Jedi joy ride. It is unclear why Obi-Wan chooses this particular mode of transportation. There are numerous other options available to him, including myriad different speeders and transports, all of which would not buck around wildly, howl like a banshee, or leave giant steaming turds all over the place. The novelization tries to give an explanation as to why he picks this mode of transportation. Apparently, Obi-Wan feels more confident with a living being because they think about their own life and a speeder doesn't. I feel that to be pretty thin. "Don't you wonder why the Jedi Council won't make you a Master?" "They don't trust you." "I would doubt the Council's judgment if they didn't choose you for this mission." Why is Anakin such an idiot? How does he not see that he is being manipulated? It's as if Palpatine is reciting from The Beginner's Guide to Manipulating an Idiot. "You must kill all the Jedi in the temple and then kill everyone in the Mustafar system. Then you will be powerful enough in the dark side to save Padme." "Okay, do you think that will work?" "Oh, yes, Anakin. Kill all the Jedi, especially the babies and the children, and you will be able to save Padme's life." "Wow, it's so simple. 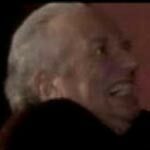 Thanks Palps!" 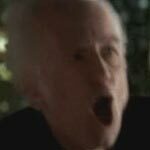 Palpatine actually says that he must kill all the Jedi in the temple, that only then will he be strong enough with the Force to save Padme. Anakin sees no problem with this. It seems to naturally follow that he will gain the power to save his wife by killing all his friends. Then, and this is what should really burn Anakin up, Palpatine informs Anakin that after he does this they will be able to figure out how this whole stopping people from dying thing actually works. In another scene reminiscent of video games, Obi-Wan begins the battle with General Grievous by chopping off one of Grievous's hands. Instead of four lightsabers, Grievous now only has three. Obi-Wan then chops off a second hand. It becomes apparently that Grievous is doing something wrong and he decides to flee. Obi-Wan has successfully beaten the first stage of this boss battle. To continue the video game nature of their battle, Obi-Wan and Grievous end up on a docking platform of some sort. At the platform, Obi-Wan discovers that Grievous has a weak spot. In an actual video game, this would be discovered through something subtle like a flashing yellow box around where you're supposed to hit him, but in the movie it's done even more subtly. In the movie, Grievous's weakness is hard to spot, but if you look closely you'll notice a giant, gaping hole in his armor through which you can see a beating humanoid heart. Obi-Wan figures out that if he shoots into that heart five or six times, it will be curtains for General Grievous. And he's right! A few shots to the exposed fleshy heart and Greivous's head explodes in an unnecessarily graphic rain of blood and fire. Hooray! Mace Windu decides, after getting information from Anakin, that he is going to confront and arrest Chancellor Palpatine. He picks as his helpers what would appear to be three of the shabbiest Jedi he could find. Saesee dies immediately. He is technically ranked as a 'Master,' though you wouldn't know it the way he holds his lightsaber in the manner most would hold a vacuum cleaner, yet uses it to even less of a defensive advantage. The novelization goes into great albeit unnecessary detail about how he had two horns but one got cut off in combat but had grown back perfectly so that one could not even tell. This makes one wonder why the horn being cut off was even brought up in the first place. Kolar lasts a second longer than Tiin, but wields his lightsaber even less expertly. By this point, the viewer is wondering if Mace even bothered to find Jedi to accompany him to Palpatine's office, or if he just rounded up some panhandlers along the way and handed out lightsabers. Kit Fisto is everyone's favorite Jedi whose name sounds like a bizarre sexual fetish. We know Kit Fisto is going to put up some fight based on his major role in the Clone Wars cartoon series. However, while Fisto does great things in the cartoon fighting alongside the Mon Calamari and using his lightsaber underwater his technique in the movie seems to more closely resemble that of a frightened, blind gimp than a Jedi Master. Fisto just holds out his lightsaber with a look of total panic on his face. His notoriety from the Clone Wars series appears to only buy him a few extra seconds of screen time before finally being struck down. 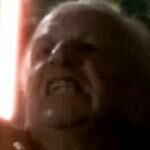 It's apparent that the intent of this scene was to show how powerful Sidious is. Unfortunately, it fails for two reasons. 1.) We haven't really seen these Jedi do anything worthy of note. Aside from Kit Fisto deflecting blaster fire from battle droids in the previous movie (which, if these movies are any indicator, it seems anyone holding a lightsaber is able to do), we haven't seen him do anything outside of the cartoon series to show that he is even a subpar Jedi. Given our lack of knowledge about the inept Jedi "Masters" that Palpatine faces, he might as well be striking down his cleaning lady. 2.) The Jedi die so quickly, by such weak attacks, that they just look like a collection of fools. If they'd already been shown as skilled swordsmen, then it would be quite shocking that Palpatine dispatched them so easily. Unfortunately, we don't know them from a hole in the wall, so Palpatine's seemingly harmless attacks make them look like unskilled circus performers. 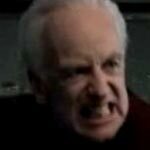 There isn't really much that needs to be said about the faces that Palpatine makes when he's battling Mace Windu. This small photo gallery really says it all. When Mace Windu and a trio of Jedi lightweights show up at Chancellor Palpatine's office to arrest him, he isn't having any of it. 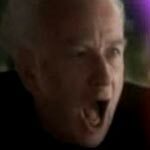 When Mace disarms Palpatine and corners him, he informs Palpatine that he has lost. 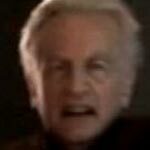 This prompts Palpatine to make a ridiculous face and scream, "No! No! No! You will die!" in what may be the silliest scene in any Star Wars movie yet. 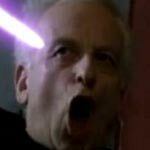 When Anakin is watching Mace deflect Palpatine's Force lightning, it becomes apparent that the scene in Return of the Jedi makes Vader recall that moment. Hearing Luke beg and plead for his life reminds him of the time that Palpatine did the same at the hands of Mace Windu, only in Return of the Jedi he makes the right choice. I don't know why it is, but it really disturbs me to imagine Darth Vader having a memory of Mace Windu. It is like some sort of unholy marriage between the original trilogy and the prequels that I want no part of. Perhaps it's because I made this crummy version of what I imagine we will see in the future DVD release of Return of the Jedi. 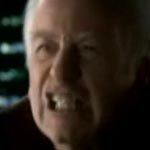 "This is all very familiar to me..."
However, the real question is this: if Mace Windu can deflect Palpatine's Force lightning, then why does Palpatine continue to blast it in his direction and subsequently fry his own face? Is it for effect? Does he want to look more evil? Or does he want to look more like an alien from Babylon 5? 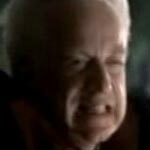 When Palpatine is lying in the corner after being scarred by his own lightning, he decides to act like an injured puppy. He starts whining and moaning, "I'm too weak. Don't kill me. Pleeeeeease don't kill me." Anakin's heart goes out to him even though it is clear to everyone that Anakin is, as the kids say, "getting played." 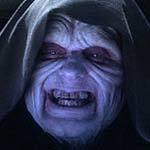 So what exactly happened to the Emperor between the end of Episode III and Episode VI? 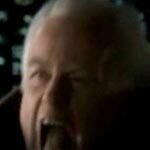 When Palpatine gets blasted with his own Force lightning, his face changes color and takes on a new form. Previously we have seen Luke get blasted to hell by Force lightning and suffer no real effects (other than what we read about him having muscle problems in an Expanded Universe novel). Anakin also gets blasted to hell in Attack of the Clones and still maintains his status as resident Jedi pretty boy. It is possible that Yoda suffered some adverse effects from the times he was blasted with Force lightning but he is just too ugly for anyone to be able to tell. Is it the deflection by a lightsaber that causes the lightning to cause facial scarring? If so, then I'll shut up right now because that makes perfect sense. Every year the Intergalactic Look-Alike Committee holds a contest to decide who has proven to look the most like Darth Sidious. It is with great pride that we show the results of this year's contest. "Hello, everyone, and welcome to the 2005 Looks Like Darth Sidious Contest. For over a thousand generations, people have been trying to look like me, with varying degrees of success! This year marks a landmark for the competition as we are faced with some of the best competitors we've ever had the pleasure of watching. So without any further ado let's get on with the competition! On behalf of the Board of Moffs and the contest sponsors, I would like to thank everyone who participated. Let me assure you that awarding points and selecting a winner is never easy. With so many qualified contestants, this year was, without a doubt, the best contest yet." "Now, without any further ado, the results!" 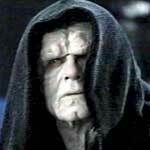 The Emperor from Return of the Jedi does a reasonable job of looking like Darth Sidious fromRevenge of the Sith. 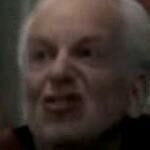 If this were an average costume party for fourth graders, Ian McDiarmid would likely win second place for his portrayal of himself as the same character. 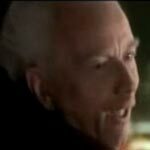 Ian McDiarmid was thought to be an early favorite in this contest, but in the end he just didn't have what it takes. The bungled play by his makeup artist in conjunction with injuries that plagued the beginning of his season contributed to the upset in this contest. Still, you have to admire him for his legacy and what he's done for the sport. Character: Granny S. Preston, Esq. 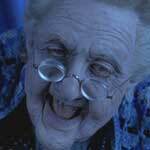 Granny S. Preston makes a strong showing, earning first runner up in the Look Like Darth Sidious Contest. He loses points for wearing glasses and for not wearing the classic Darth Sidious/Emperor Palpatine black cloak. However, Alex shows his versatility by shrugging off these handicaps and putting in a strong performance. His rotted teeth earn him extra points. 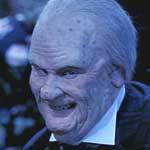 Dan Aykroyd's portrayal of Judge Alvin 'J.P' Valkenheiser has long been a dominant force in the Looking Like Darth Sidious Circuit. Ian McDiarmid's "Emperor Palpatine" floundered in the first round which allowed Dan Aykroyd to run away with the Sidious Cup this year.